This is in fact a reprint of the original book Spirits of the Sacred Grove (1998). 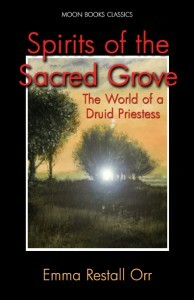 It was later published and re-titled Druid Priestess. I remember the original version and being amazed by it. I had also seen Emma, a.k.a. Bobcat, at the Pagan Federation conferences in Croydon (London), and was awe-struck by her appearance. She appeared along with Philip Shallcrass. They were witty and lucid and totally inspiring. Following the Wheel of the Year, she starts with ‘Samhain: the year begins in the dark north-west’. Telling the story, her story, the year unfolds. Interspersed with her own thoughts Emma philosophises over Druid cosmology, spirituality… and much more. As the wheel turns through the dark of the year the brightness of Spring explodes. As Druid priestess and guide she takes us along the sacred rituals and Rites of Passage, through the archetypal and the personal. I would recommend this book to anyone who ever doubted the value of ritual as a path of self-development and much more! It was a pleasure to re-read this book. It hasn’t lost its charm or powerful inspiration.